The Artisan Cheesemaking and Tasting is available before the Farmer's Apprentice tour. During this workshop, participants join an instructor at the farmhouse to learn how to make queso blanco, a simple, white soft cheese. Participants work in small groups to perform each step of the cheesemaking process: learning about basic components and equipment, heating the milk and watching the transformation of milk into curds and whey, draining the curd in a cheesecloth, and sampling their own batch at the end of the workshop. Participants learn about the difference between soft and hard cheeses, and play "cheese jeopardy" while waiting for the milk to heat. 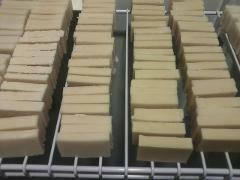 The Goat's Milk Soapmaking is available is before the Farmer's Apprentice tour. 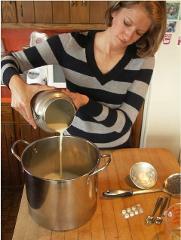 During this workshop experience, participants join an instructor to learn how to make homemade goat's milk soap. Participants work with the instructor to perform each step of the soap-making process: measuring out the ingredients, blending them, and placing the soap in a mold to harden. Each participant will leave with a bar of goat's milk soap from a previous class that has already hardened and cured. Join a guided walking tour of a homestead farm. 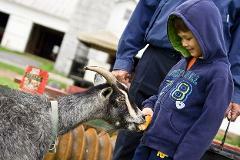 Visit the cows and calves and interact with small animals. Learn how cows turn feed into milk, why our cows wear earrings, and learn all about a farmer's day. The Farmer's Apprentice tour may be added to the Goat's Milk Soap Workshop (please reserve your place for the Apprentice tour separately).